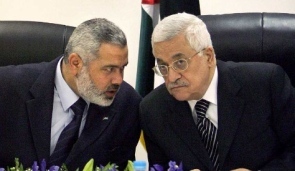 The Palestinian factions Fatah and Hamas reportedly announced the next Palestinian government will be located in the Hamas-controlled Gaza Strip, while the next prime minister will be from Gaza. Ahmed Yousef, a top political adviser to Hamas, confirmed today those arrangements were made as part of a political program for a future unity government between Hamas and the U.S.-backed Fatah party. Last May, this journalist, writing at WND, was first to report it was quietly agreed upon between Fatah and Hamas that as part of any future unity deal the new Palestinian prime minister will be from the Hamas-controlled Gaza Strip while the government will be located in Gaza. According to sources in both the PA and Hamas speaking to WND in May, the unity deal not only leaves Hamas in full security control of the Gaza Strip, but it paves the way for tens of thousands of Hamas security forces to be placed on the PA payroll. Those same sources confirmed to WND today the security arrangement deal remains in place. The sources said a common apparatus will be created to pay both Hamas and Fatah forces after the first year of the unity deal. WND first reported in March that between 15,000 and 20,000 Hamas forces will be placed on the PA’s payroll if a unity deal is forged. The PA is funded in large part by the U.S. and Europe. The technical explanation being given by PA sources is that the Palestinian leadership believes it is better to maintain one major financial apparatus to pay all security forces, instead of having a separate governmental system in Gaza run by Hamas. Monthly salaries of Hamas security officers in Gaza typically range from between 800 and 1,500 shekel, or between $244 and $421.